It is the time of the year for vacation and we know some extra cash will come in handy! That’s why we’re introducing to you the ‘December Referral Contest’. If you know of any friends or family members who want to join Grab, now’s the best time for you! From 10 Dec – 31 Dec 2018, if you refer at least 3 individuals to Grab, you will enjoy a bonus of RM500 on top of your regular referral fee of RM100* per referral! All you need to do is ensure your referral completes 30 jobs within 15 days of activation and you’re good to go. Don’t miss out – this promotion is valid to the first 50 driver-partners only! 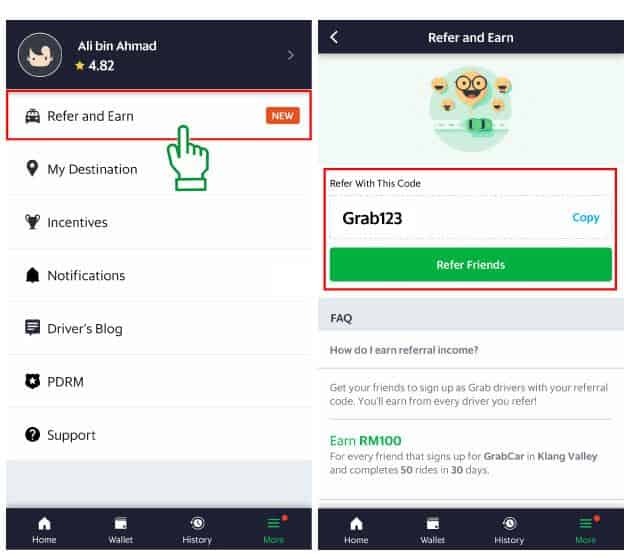 Refer at least 3 friends to be a Grab driver-partner from 10 Dec – 31 Dec 2018. Just send them an invitation via the Grab driver app. Campaign duration is 10 Dec – 31 Dec 2018. Referred driver-partners have to be activated within this time period in order to be eligible for this promotion. Grab driver-partners will be notified if they are eligible for the bonus by 15 January 2019. Referred driver-partners must be new, which also excludes MyTeksi/existing GC/ex GC-fleet and previously terminated/banned driver-partners. This referral bonus is not applicable to Alpha drivers-partners.